So Zeke might not think its actually fun times--he kind of looks put out to me. 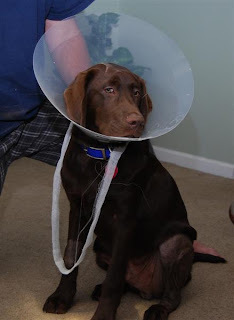 The vet gave us this satellite dish to keep Zeke from chewing on his staples, but Zeke, being the super pup he is, hasn't bothered them in the least. So he doesn't have to wear the cone, except for last night for a photo op. As for Zeke's status, he is getting along very well, I have started reducing his pain meds a little so he does not fall prey to addiction and find himself like so many other dogs relagated to a life on the streets. He climbed the stairs yesterday and went back down them with a little extra support. Zeke is back to work with me, he mostly stays in my office as the floors in the hallways are too slick for him and he is still on medical orders to stay calm and quiet. I think everyone is glad to have him back.